One of the things to be aware of when you are speaking to Mormons is that they use a lot of Christian terms but as all cults do they have redefined those terms. Christians and Mormons have a tendency to talk past one another sometimes due to these different definitions. Make sure to ask them to define words like grace, salvation, atonement, unchanging, etc. instead of assuming they mean the same thing by them as we Christians do. I pray God blesses your attempts to reach out to these deceived people. Joseph Smith claims to have had a vision when he was 14 (1820) where he saw Heavenly Father and Jesus Christ. Ask a Mormon how this claim works with 1 Tim 6:15-16 and John 6:46 which say that no man can see the Father. The quote from Lorenzo Snow and the excerpt from Joseph Smith’s Sermon are well-known to most LDS members (Mormons) and they will acknowledge and affirm them. Ask them how these quotes comport with Isaiah 43:10, Isaiah 44:6-8, Psalm 90:2 and Malachi 3:6. God says in Isa 43:10 that their was no god formed before Him nor shall there be any after Him. How can we become gods like God, if God himself says that there will be no gods formed after him? God says in Isa 44:8 that he knows of no other God. How is it possible for Joseph Smith and Lorenzo Snow to know that God was once a man who worshiped his own God but God himself says that he knows of no other God? In Psalm 90:2 it says that God has been God from everlasting to everlasting. God has eternally been God. How does this comport with the statement that God was once a man and that God has not been God from all eternity? Malachi 3:6 says that God does not change. Isn’t going from a man to a god a change? This next section is asking them to resolve the Mormon vs the Biblical doctrine of Salvation by Grace. Ask them how they resolve the contradiction of this verse with Ephesians 2:8. The verse above says that we are saved after all we can do, but Paul says in Ephesians that our salvation is not our own doing? Ask how they resolve Alma 11:37 with Paul in Romans 4:5 and Romans 3:8? Alma 11:37 says that God cannot save them in their sins but Paul says that God justifies the ungodly by faith apart from works. Ask them how Moroni 10:32 is reconciled with these two verses (Romans 4:5 and Romans 3:8). This verse says that God’s grace is not sufficient unless we have denied ourselves from all ungodliness. Ask them if they have denied themselves from all ungodliness? If they actually have the pride to say that they have ask them if they ever repent? If they say they do then they must not have denied themselves of all ungodliness or there would not be a need to ever repent. Ask them how they resolve the Doctrine and Covenants 82:7 that says that if we sin all the former sins return to us with Hebrews 10:16-17 and Psalms 103:12 that says that God remembers our sin no more and He removes then from us as far as the East is from the West. Ask them of Heavenly Father has a body of flesh and bones? Ask them to read or read to then Doctrine and Covenants 130:22. Ask them how they resolve this contradiction with John 4:24 which say that God is spirit and Jesus in Luke 24:39 that says spirit does not have flesh and bones? If they object saying that we say Jesus is God and Jesus had flesh and bone, respond by saying that the Son of God in his Eternal existence did not have a body of flesh and bones but he humbled himself (Phil 2:7) and took on the likeness of man for the salvation of his people. Jesus however has not eternally existed with a body of flesh and bones. The Bible establishes the standard for a prophet in Deuteronomy 18:20-22. The standard for a prophet according to the Bible is if he prophecy’s anything that does not come true he is not a prophet of God and we should not fear anything that he says. Joseph Smith prophesied in Doctrine and Covenants 84:1-4 (see below) that in his generation the city of the New Jerusalem would begin to be established in the western boundaries of the State of Missouri beginning with the temple. This has not happened even to this day. According to the Biblical standard Joseph Smith is a false prophet and should not be feared or followed. D&C 84:1 A revelation of Jesus Christ unto his servant Joseph Smith, Jun., and six elders, as they united their hearts and lifted their voices on high. 2 Yea, the word of the Lord concerning his church, established in the last days for the restoration of his people, as he has spoken by the mouth of his prophets, and for the gathering of his saints to stand upon Mount Zion, which shall be the city of New Jerusalem. 3 Which city shall be built, beginning at the temple lot, which is appointed by the finger of the Lord, in the western boundaries of the State of Missouri, and dedicated by the hand of Joseph Smith, Jun., and others with whom the Lord was well pleased.4 Verily this is the word of the Lord, that the city New Jerusalem shall be built by the gathering of the saints, beginning at this place, even the place of the temple, which temple shall be reared in this generation. Mormons will almost always ask you if you have prayed about the truth of the Book of Mormon. They will then quote James 1:5 and Moroni 10:4 and say that we need to pray about the Book of Mormon to God and if we ask with sincerity he will reveal to us that it is true. The way to respond to this is to ask them if there are false spirits out in the world. If they say yes, then ask them how we are to test to see if Mormonism comes from a false spirit? Quote 1 John 4:1. If Mormonism comes from a false spirit and we pray to that false spirit could that false spirit not gives us a burning in our bosom (Mormon belief) so that we will be deceived. We are to test the spirits with the unchanging eternal Word of God. At this point the Mormon will probably say that the Bible has been corrupted and that it has not been translated correctly. They may quote Articles of Faith 1:8. The way to respond to this is to quote the words of Jesus in Luke 21:33. Jesus said that his word would be preserved. If the God of the Bible is the sovereign Creator of all things as the Bible claims then would he not be able to preserve his word as he said he would? Does He not accomplish all He purposes to (Isaiah 46:10)? I hope these questions and defensive options are helpful to you in your endeavors to obey the Great Commission and reaching out to Mormons. 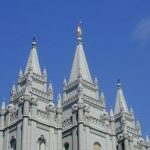 I cannot take credit for most of the questions as I have not had that many encounters with Mormons and done as much research and study on Mormonism as I have done with other world views. I want to credit Matt Slick at CARM for some of the material (CARM Mormonism page), Dr. James White of Alpha and Omega Ministries and Jeff Durbin from Apologia Church (Apologia YouTube Mormonism playlist) as the sources for many of these arguments. Thanks for reading and may God bless. Thank you, very very helpful!